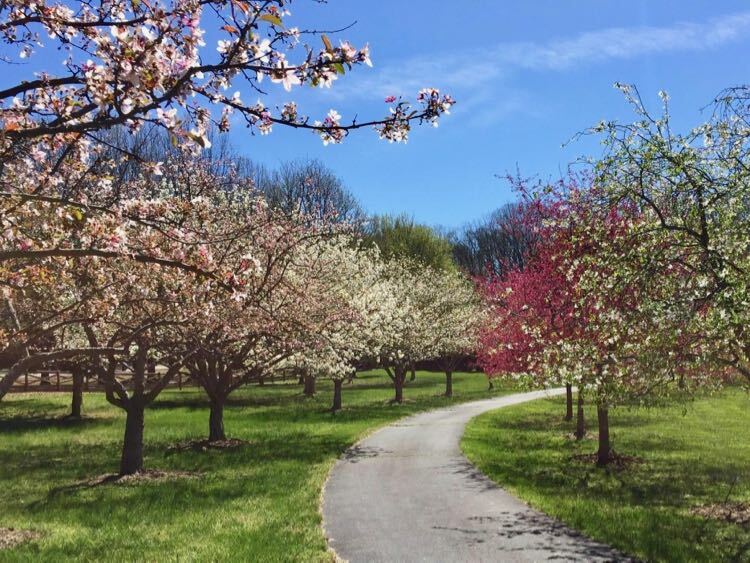 Explore 8 great Spring hikes in Northern VA for beautiful views, interesting stops, and fun outings close to Washington DC. These are the best easy Spring walks in the area, because they generally don’t get too waterlogged. Spring hikes are an excellent antidote to the dark days of winter, when the air was too cold and the trails were too icy to tempt us. When warmer Spring weather arrives, we look for trails that can stand up to rains and snowmelt. 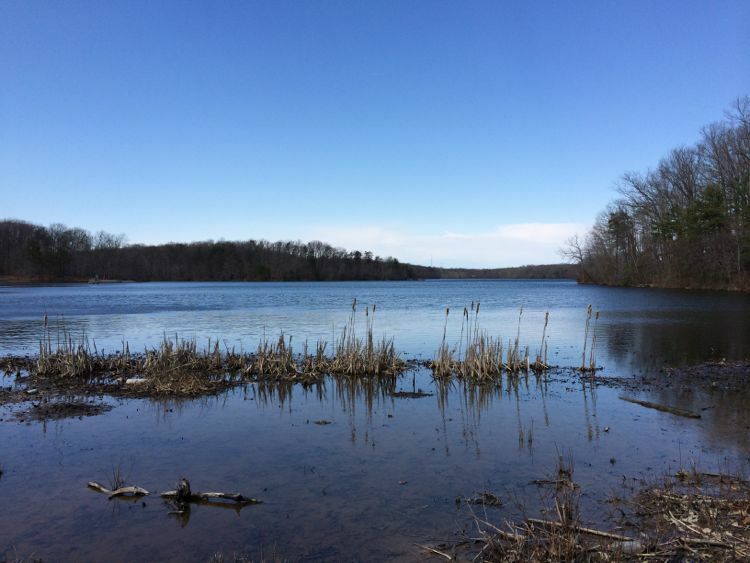 These Spring hikes in Northern Virginia offer nice views and interesting stops along the way. 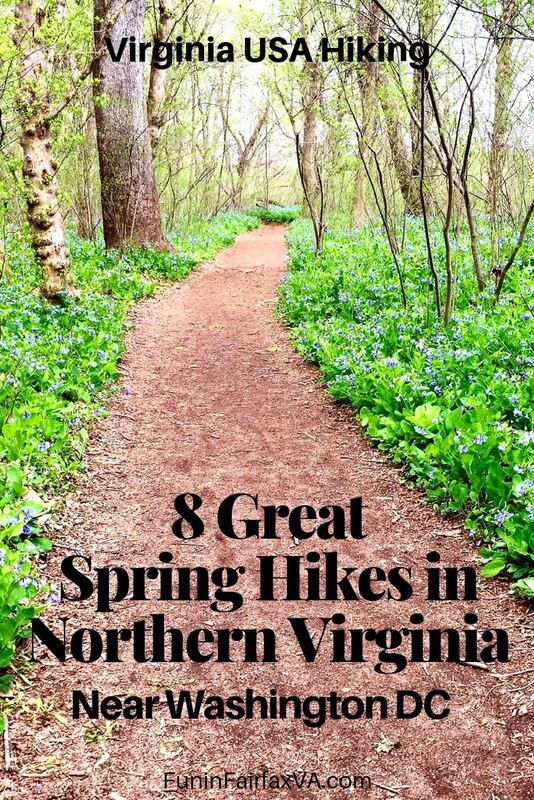 These 8 great Spring hikes in Northern Virginia cover 3 to 5 mile walks, over easy to moderate terrain. Some of the hikes are stroller friendly, and one is wheelchair accessible. 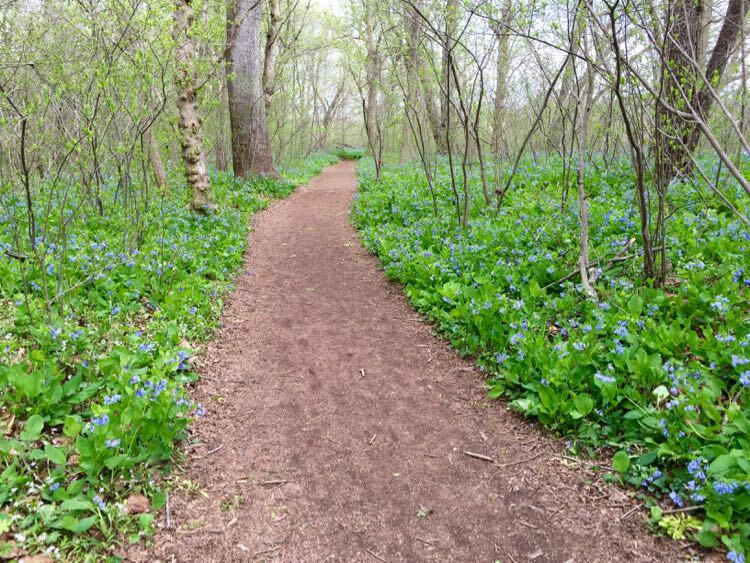 The Potomac Heritage Trail at Riverbend Park is one of the best Spring hikes in Northern VA. In early April, the sandy trail is bordered with a profusion of bluebells. The delicate blossoms cover the ground and fill the woods with color. This is an excellent family hike, with an easy trail and lots to see. Above the trail, white Sycamore trunks stand out against blue skies, while birds swoop over the Potomac River. Bluebells are a highlight, but you’ll also see trillium, may apple, and other wildflowers along the trial. 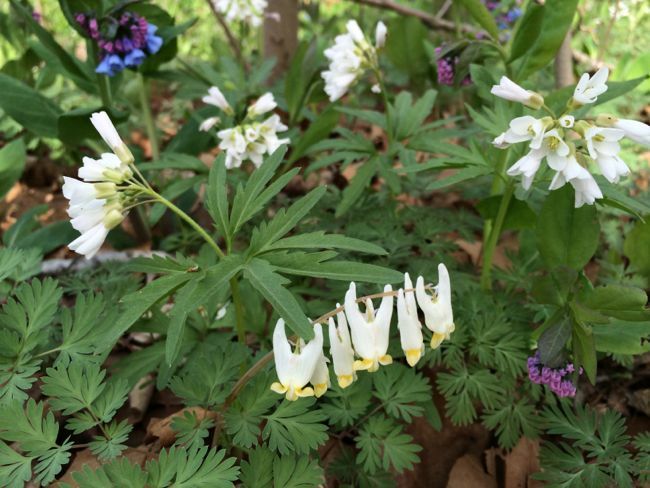 Take our guide, Spring Wildflowers and Where to Find Them in Northern Virginia, along and see how many varieties you can find. The trail at Riverbend is level and close to the river except for a 600-yard cutback that takes a steep detour over a bluff. Begin your hike at the Riverbend Park Visitor Center, which offers educational displays and restroom facilities. 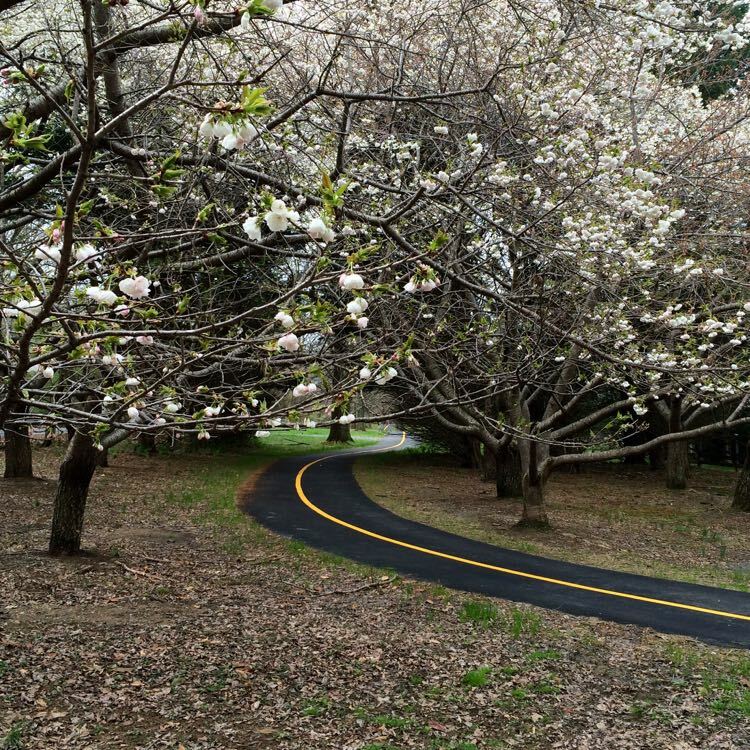 Looking for cherry blossoms without the crowds of the DC Tidal Basin? Check out our insiders guide to Where to See Cherry Blossoms In DC, Maryland and Virginia. 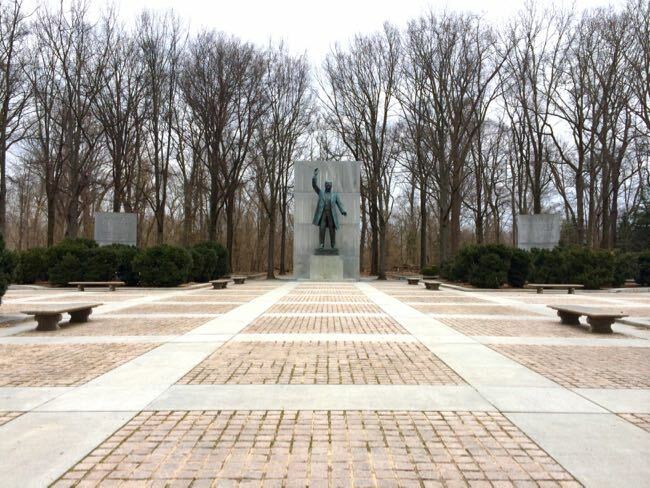 Theodore Roosevelt Island offers one of the best spring hikes close to Washington DC. In fact, the island is technically part of DC, but the parking and access are in Virginia. The trail gets muddy after heavy rains and when the Potomac River floods, but otherwise the island offers an easy Spring walk with interesting sights. Roosevelt Island trails are popular with birders, joggers, families, and workers out for a break. Hikers enjoy dirt paths, a long boardwalk, and interesting history at the plaza that tops the island. Follow the mostly level Swamp Trail to see wetland birds and peeks of DC across the river. Then climb the low hill to see the park memorials to Theodore Roosevelt (a good picnic spot). Return in late spring and summer to see the wetlands transformed into a green oasis. 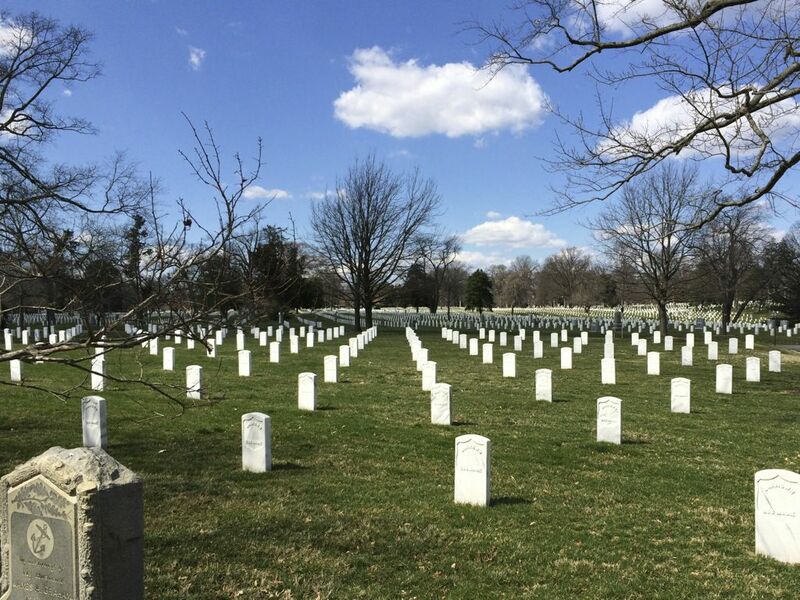 Arlington National Cemetery is a good choice for a spring hike devoted to solitude and reflection. To really appreciate the magnitude of our nation’s heroes and loss, we recommend a long walk on the streets throughout the cemetery. In Spring, you’ll see beautiful blooming cherry trees and haze-free views of DC, and the paved streets are usable even after heavy rains. Arlington Cemetery is not a place for play. Picnicking, jogging, and biking are not allowed, and visitors should use decorum in this solemn place. Venture beyond the main bus stops, and take time to honor the heroes at rest in this beautiful and heart-breaking place. 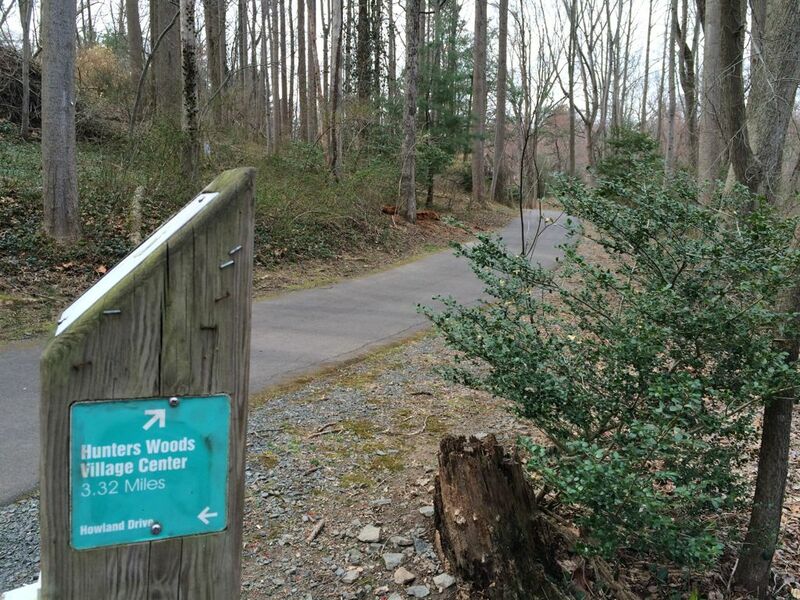 The Meadowlark Botanical Gardens Connector Trail, which opened in 2014, is a paved 1.25 pathway linking the W&OD bike trail to beautiful Meadowlark Botanical Gardens. This is a beautiful Spring hike, when your efforts are rewarded with blooming cherry trees along the trail and in the park. Crabapple and magnolia trees also line the trails with Spring blooms. The connector is very steep as it approaches Meadowlark Gardens, so you’ll get a good workout. If your outing includes strollers or children, you’re better off parking at Meadowlark to hike the more forgiving trails inside the garden and along the front. The small entry fee to Meadowlark is well worth your access to more flowering trees and plants along the pond and throughout the gardens. 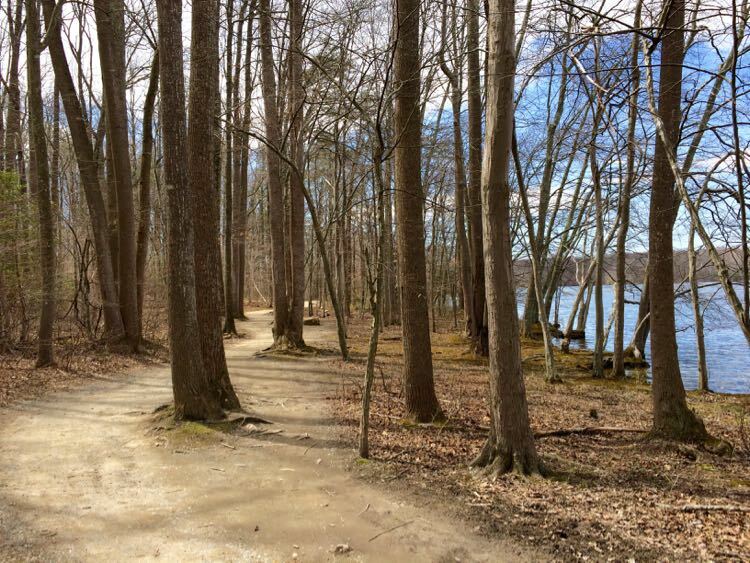 The 4.5 mile trail around Burke Lake makes our great hikes list in every season. In Spring, the wide dirt and stone-dust trail stays relatively dry even after a storm. Birds are especially active as they battle for a mate. Trees and flowers are vibrant in their new green colors. In early April, a scale-model train ride and carousel began weekend operations, so there is extra fun if you’re hiking with kids. The trail is mostly level so it’s a good option for families. A paved portion of the trail is wheelchair accessible and offers ADA-compliant fishing platforms. 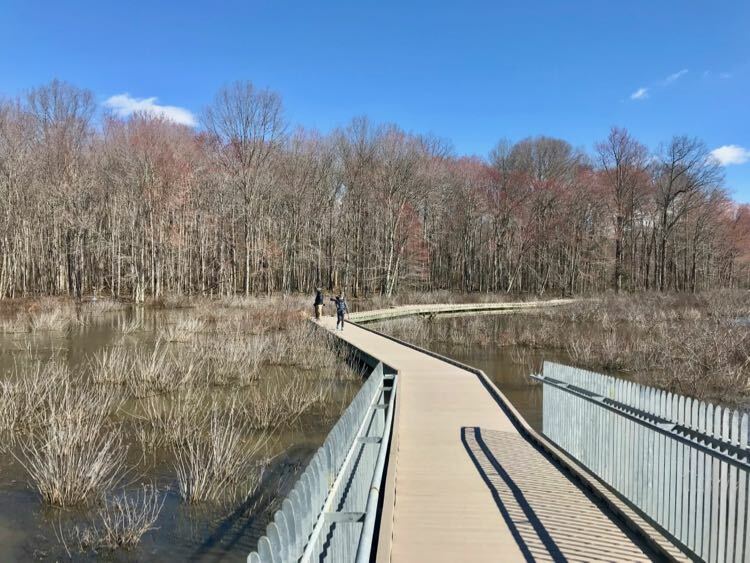 The Glade Stream Valley Trail and Walker Nature House, in Reston, combines a paved path along a wetland and a fun nature center. The Glade stream was improved to reduce flooding and erosion, and its now a lovely spot for spring hikes. Keep an eye out for eagles, foxes, and other wildlife in the wetland. Begin your hike at Twin Branches Road and follow the signs that point toward Hunters Woods. This route adds some hills to your walk. Alternatively, you can park on Soapstone Road and enjoy a level section of the paved path that is stroller and wheelchair friendly. Dirt trails through the woods connect to the Walker Nature House, which offers information about local nature, along with bathrooms and a water fountain. 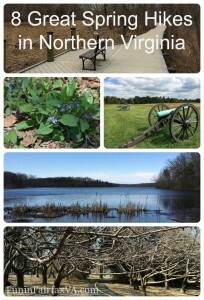 The nearby Lake Thoreau Loop Trail in Reston offers another nice option for spring hikes in Northern Virginia. Many of the trails at Manassas National Battlefield cross open fields that were the scene of the Civil War battles at First and Second Manassas. That makes them a good choice in Spring before the heat, humidity, and ticks of summer arrive. Begin at the Visitor Center to get input from the Park Rangers about any muddy areas to avoid. Manassas is beautiful now, but a walk across the battlefields gives visitors a deeper appreciation of the difficult conditions and battles fought there by patriots from the north and the south. Extend your fun with an overnight getaway in historic Manassas. 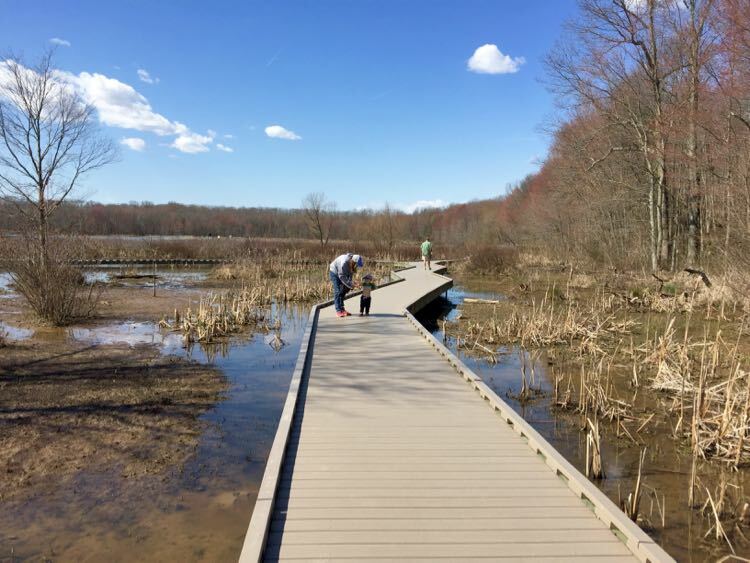 Explore a unique hemi-marsh on the Huntley Meadows Park hike, a hidden gem in the Fairfax County Park system. The wetland is perfect for a Spring hike when the plants, animals, and birds emerge from their winter naps. 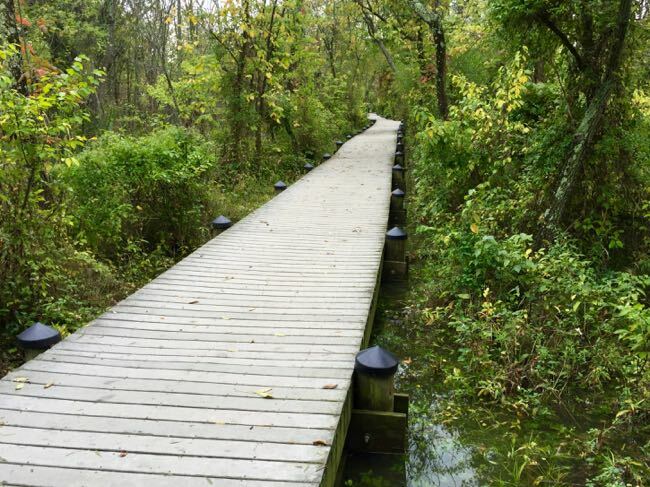 Walk the 2-mile loop trail from the Visitor Center through the woodlands and over the beautiful marsh boardwalk. You may see resident beavers and deer, and you are sure to see turtles and a great variety of birds. 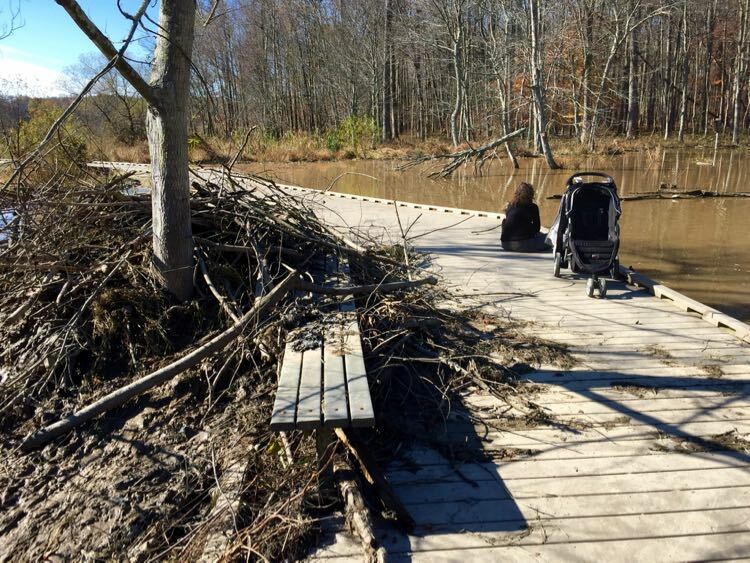 On one visit beavers had built their dam over part of the boardwalk, offering a close-up look at nature. The Observation Tower is a great place for a picnic and to enjoy the view. 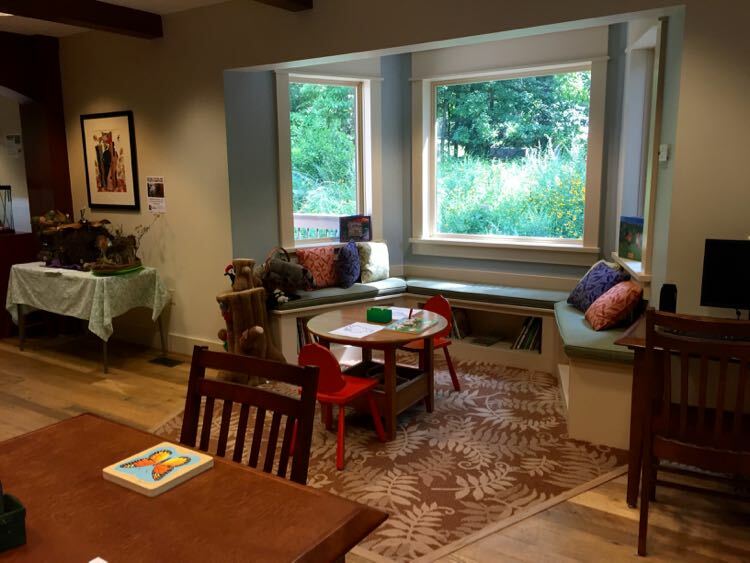 After your hike, stop in the Visitor Center to learn more about the unique nature that calls Huntley Meadows home. 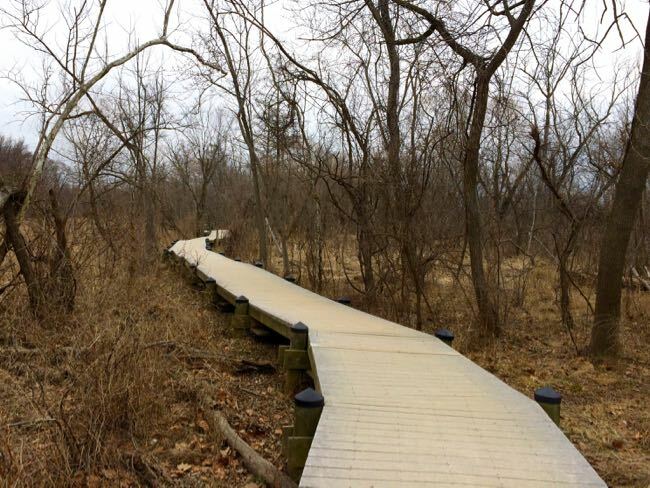 Huntley Meadows wide stone dust trail and boardwalk are stroller-friendly and ADA compliant. Find more unique and surprising places to visit in our guide: 20 Must See Northern Virginia Hidden Gems Rich in Nature and History. These Spring hikes in Northern VA are a fantastic opportunity to see the changing season. return to these hikes throughout the season and see the views transformed as green returns and blooms emerge. Whichever Spring trail you choose, you will find something new to see on every outing. Find more spring festivals and outings, suggested by local experts, in our guide to Fabulous Ways to Celebrate Spring in Northern Virginia. 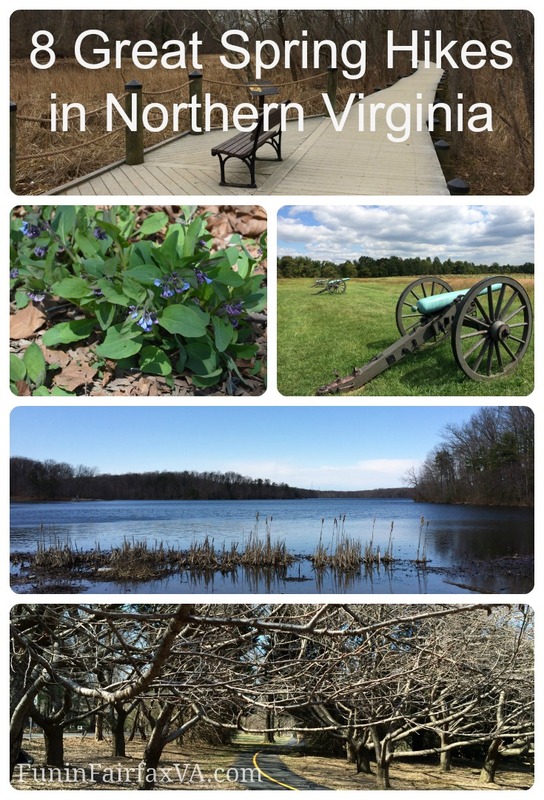 What are your favorite Spring hikes in Northern Virginia? Please share your tips in the comments below. Thanks for visiting and happy hiking! Follow Fun in Fairfax VA on Facebook, Twitter, Pinterest, and Instagram for more fun places to visit, things to do, dining, and travel in and from the greater Washington DC region. Pinned. This is a great assortment of sites. I’m glad you included both historic and nature sites, including Arlington National Cemetary. Thank you Kristin! There is so much incredible history in the Northern Virginia area. I love the opportunity to learn something new while I’m out enjoying nature. Happy hiking to you! I would probably add Great Falls in here as well. Henk and I were there last October and it was a great place for trails and hiking. Yes, Great Falls is a fantastic place to hike. We include it on our Summer, Fall, and Winter round-ups so decided to include some alternates for Spring. The River Trail at Great Falls is one of our favorites, but it can be pretty muddy in Spring. Still a beautiful choice year-round. Thanks for leaving your tip Jane! Love all these. 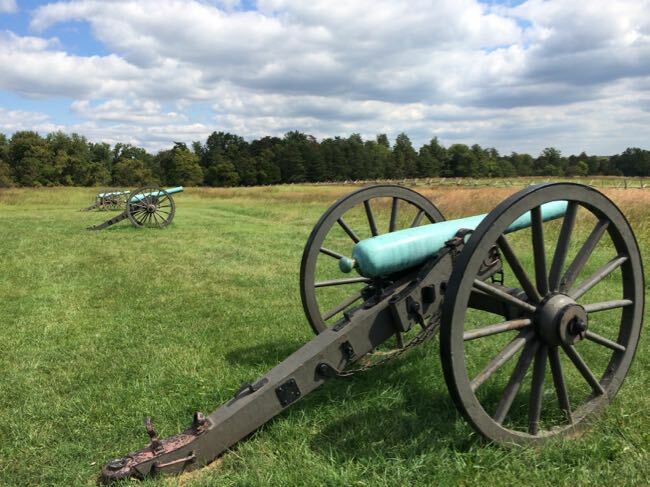 While living in Culpeper we covered the Manassas Battlefield several times. Wish we would have known about Glade Stream Valley in Reston. Thanks for the feedback! Love hiking at Manassas Battlefield and then stopping at Winery at Bull Run for some local wine. Great list – pinned it for future reference. Thanks for the nice feedback and happy hiking!